The PBS movie Anne of Green Gables: Fire & Dew will debut on September 23 at 7:30 PM. Anne Shirley (Ella Ballentine) heads to school in the city while Matthew and Marilla (Martin Sheen and Sara Botsford) face emptiness. 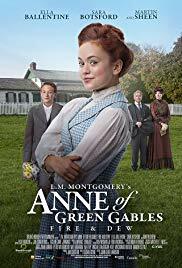 Will Anne, overwhelmed by competition – especially from Gilbert Blythe – find that the dark cloud over her life does have a silver lining?